So trends come and go in the supplement industry, but the latest trend of more transparent labeling and less proprietary blends seems to be here for good. Starting in 2014 and really exploding in 2015 and 2016 more and more companies are finding they sell more product when they clearly state what is in it. It is now 2019 and everything new seems to be transparently labeled. Go figure huh.. This is completely understandable as consumers would always rather buy a product where they know what they’re paying for vs. a product where they just have to “trust the brand” to put in proper dosages of the good stuff. TL;DR: MusclePharm Assault Black is a definite step up over the regular old Assault and now that we’ve tried it we wont’ go back. For a well-rounded, fair valued pre-workout we’d take Black over C4 any and every day. You can shop Assault Black here on Amazon. Read on for details on energy, pump, and flavor. With seemingly annual stories about brands skimping out on active ingredients and amino spiking their protein blends, it’s no wonder people are wary of supplement brands. There have been companies listing their active ingredients, usually the good stuff like beta alanine and citrulline malate in pre-workouts, or the amount of leucine in BCAA supplements, but they were few and far between. Still, consumers took note and brands like Pre-Jym from Jym Stoppani gained fame primarily because of the transparent dosing they marketed. Not to be left out, one by one, established brands are also trying to tap into this non-proprietary blend trend. Since they have spent years painstakingly building their own current brands, such as Cellucor’s “C4” and Musclepharm’s “Assualt” they can’t just drop those product lines altogether as they are still huge money earners. So the established big players have instead released “premium” versions of their existing products. By launching a new premium version they can both charge more and jump on the transparent labeling trend. Musclepharm has done this by launching a premium version of their famed Assault pre-workout called Assault Black. We bought a tub and have been taking it 5 days a week for the last 3 weeks. Over this time we’ve developed a few opinions and would like to point out what makes this pre-workout unique in the write-up below. 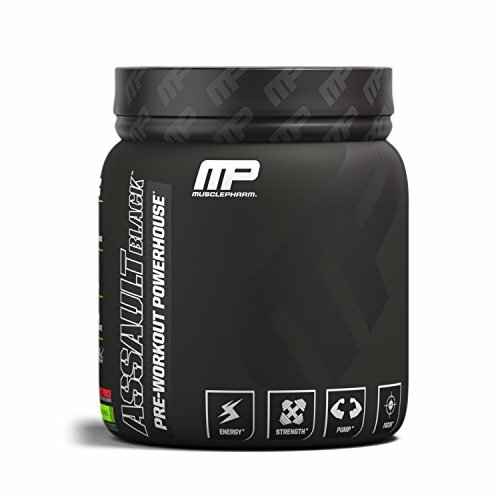 Assault Black is an all-in-one pre-workout with no proprietary blends. It features 3grams of citrulline malate, 2 grams of beta alanine, and 750mg or Agmatine Sulfate as the 3 big components for stamina and power. These may be slightly below what some brands are dosing, although those brands also usually charge closer to $50 for a tub containing maybe 20 servings max. Musclepharm has seemingly tried to strike a balance between efficacy and pricing, choosing to do slightly smaller dosages than some non-proprietary brands, but fitting a full 30 servings in their tub and keeping the price well below $40. Since we’re not made of gold we appreciate this effort. Very few people can afford to shell out $50 twice a month for some pre-workout with massive scoop sizes. Assault Black offers a fair balance of price per serving and quality ingredients. Compared to regular Assault, Black offers both an upgrade in ingredients used as well as the dosages of the most effective components. Supplementing these 3 big dogs is a variety of vitamins for immune support, including massive doses of vitamins C, E, B6, and B12. We like that Musclepharm Black threw these in their blend. It’s not a huge selling angle and a lot of pre-workouts do without the vitamins completely. In our opinion though, in terms of both keeping the immune system strong and soaking the body in vitamins it needs to recover is a great and valuable addition. Gyms are absolutely crawling with germs. Doctors regularly claim door knobs to be some of the dirtiest things in everyday life, even dirtier in a bacterial sense than toilets. This is simply due to the fact people are touching door handles all day everyday without washing their hands. Well, a gym is a thousand times more “touchy”. Instead of one door knob, literally every single piece of equipment is being touched and sweated on all day every day by sometimes hundreds of people. Needless to say, gyms are pretty much bacteria meccas and so any vitamins that can help keep you from getting sick are a huge bonus. Getting sick blows. It is not pleasant but more importantly it keeps you from working out at 100%, which can impact your precious gains. Throwing vitamins in to boost the immune system is a great addition. Yaaa Da Puuuump.. in da choppaaaaa aaaagggghhh.. *cough, excuse us, the pump took over.. the glorious thought of the pump.. greater than everything else. Assault Black promises pump.. does it deliver? Added to L-Citrulline DL-Malate in a 2:1 ratio for the pump is the 750mg of agmatine sulfate, 200mg of Betaine Anhydrous, 200mg of Hawthorn berry powder and 10mg of Bioperine help get it all absorbed as quickly as possible. The pump effect of Assault Black is one of its shining attributes. The energy aspect is a little lacking, which we will touch upon later, but once this stuff gets going you can go for quite a while and vein out the whole time. We notices solid vascularity on arm and back days and after two weeks of using this we seemed to be more vascular all around, even having bicep veins popping on leg days. For us, that’s a job well done in the pump department. Pre-workouts are usually used first and foremost for energy and endurance, but one that supports actual power output is a welcome addition to the list of added benefits. How does Assault Black deliver on this front? For maximizing strength there is 1.5g of Creatine HCI and a modest dose of BCAAs in a 2:3:1 ratio of L-Leucine, L-Isoleucine, and L-Valine. This is a hard one to measure without a long history of documented one rep PRs and multi-rep PRs, which we don’t really do since Skinny Yoked is more about that bodybuilding life than that powerlifting life. Our workouts were solid, and weights were in line with what we usually push. Things didn’t feel a ton lighter, but we weren’t dragging like sometimes when hitting the gym completely pre-workout free. The 1.5 of creatine is nice. Some will want more, but we like this “maintenance” amount because it keeps the bodies reserves from being depleted but is small enough where if you wanted to stack more creatine you could, and since creatine is cheap as hell, that’s what people usually do, dosing larger at 3-6 grams daily. If Musclepharm would have loaded this in their formula they probably wouldn’t have been able to fit a full 30 servings into a tub. Also, not everyone is wanting to be in a fully loaded creatine cycle, so this modest amount is the best of both worlds. BCAAs are also a nice caveat, getting some aminos in the blood before the workout to help combat a catabolic state which can occur if working out for an extended period of time. We like that Leucine was #1, as that is the most anabolic of the aminos. Still, 1.5grams is quite small so we stacked Assault Black with Xtend’s BCAA intraworkout to maintain a continually anabolic environment. If you are a novice lifter then endurance may not be the most important factor or even a factor at all when starting. You’ll most likely be more concerned with total weight and getting through all your exercises with perfect form. After lifting for 3+ years though, your body needs more and more stimulation to grow, and so workouts grow in length and the need for endurance support grows. CarnoSyn Beta-Alanine dosed at a full 2 grams and elevATP (ancient peat, apple extract compound) at 150mg. After the pump, the endurance factor was the next most impressive aspect of this blend and honestly one that would make us buy it again. Having worked out for about 5 years solid now our workouts can stretch out, sometimes exceeding two hours on leg or back days when there are a lot of muscles to hit with various angles. Factor in daily fatigue, which can be noticeable if working out in the evening or P.M, and having a pre-workout that not only get’s you going but keeps you going is a huge plus. Prior to using Black we often would simply mix Optimum Nutritions Amino Energy with pure Beta Alanine from NOW nutrition for custom pre-workouts designed to increase endurance. This helps with higher rep range exercises, say leg extensions, where we often do 20-16-14-12 type working sets. The burn is still there, but the end of the reps are more manageable with some endurance booster on hand. The ability to stay zoned in and “mind muscle” connected is something we value in a supplement and this was definitely one of Assault Blacks strengths. Mind muscle connection is no joke, just watch any Kai Greene training video.. or any IFBB pro training video and you will undoubtably here “mind muscle” mentioned at least a half dozen times. Caffeine is a proven focus-enhancer. Assault Black capitalizes on that and more with their double-neuro igniter blend. Caffeine Anhydrous at 300mg and Huperzine A (Huperzine Serrata) at 100mcg. By neuro igniter we presume Musclepharm is talking energy here as we have the 300mg of caffeine anhydrous. Oddly, the caffeine/energy effect didn’t hit nearly as hard as most other preworkouts we’ve tried. Compared to PWOs like BSN NoXplode, Betancourts B-Nox, Cellucor’s C4 or Optimum Nutrition’s Pre-workout, Assault Black was kind of lacking in “kick”. Honestly, we’re not big fans of pre-workouts that hit hard in the energy department. If it feels like we are about to go into cardiac arrest it kind of distracts from the mind muscle focus we always like to obtain during long intense workouts. Oddly Assault Black didn’t hit nearly as hard as the above mentioned pre-workouts, some of which contained much less caffeine per serving, which is perplexing. Huperzine A is an interesting compound and seems to be one of the few “nootropics” that has some positive research regarding its effect on the brain. In summary, it seems to work to inhibit an enzyme responsible for degradation of neurotransmitters in the brain and is being researched for use with people with alzheimers. As always, Examine.com has a full low-down on this compound we’re glad Musclepharm threw into the blend with Assault Black. It has positive research and it makes it unique. Overall Assault Black is one of our new favorite pre-workouts. Like the original Assault, it is not a “big hitter” in terms of making you feel like you just snorted a line of coke and chugged a 24oz red bull, but if that’s the feeling you want when you go into the gym, well, god bless you. For us, a solid energy with a smooth turn on, backed up by steady focus and the feeling of being able to “do more”, even at the end of a workout, even when doing a “burnout” set, well, that’s a pre-workout we’d buy again. Factor in the unique ingredient profile and the fair pricing (usually around the $35 range for 30 servings), which is well below many other “non proprietary blend” pre-workouts, and we may have a new favorite to add to the list.